Creating an artificial scarcity of development land in Dublin in particular from the 1960s when economic development took off, resulted in urban sprawl that has been judged to be the worst in Europe. The rezoning system copied from the UK which has a history of underbuilding (the French have built 8m more housing units since 1970) made land for building artificially scarce and Nimbies (not in my backyard syndrome) were given a convenient excuse to keep densities low in Dublin. In 2006, Dublin's sprawl was cited by the European Environment Agency (EEA) as a "worst-case scenario" of urban planning so that newer EU member states such as Poland might avoid making the same mistakes. The Ballymun social disaster of the 1960s where public housing for young families with limited or no amenities; with no resident management and where no one had a personal stake in their units; led to what can be termed "Ballymun Syndrome," with high-rise buildings becoming a taboo in Ireland. Also in the 1960s two high rise commercial buildings were completed. Dublin’s Liberty Hall opened in 1965 and has 16 storeys standing some 59. 4 metres while Cork County Hall in 1968 became Ireland’s tallest building and kept the record for 40 years. It also is a 16-storey building at 64.3 metres high and following a refurbishment in 2006, its height was extended to 67 metres. In September 2008 in Cork City Centre, adjacent to the City Hall, the 17-storey Elysian Tower together with connected 6-8 storey buildings on a 3-acre site, was completed for commercial and residential use. The tower is 68.28 metres high and today is Ireland’s tallest building. It’s reported that the development cost €150m and the completion coincided with the busting of the Celtic Tiger property bubble and global recession. Ten years later in 2018, the US property landlord Kennedy Wilson agreed to acquire the Elysium project for about €95m. Cork City with about 10% of the population of Dublin, has 2 of the 3 tallest buildings in the Republic. Change is slowly happening in Dublin and last May a 595-unit 8-storey budget hotel and aparthotel was approved to be built in the city centre area. A government report published in April 2018 said “there is evidence that 6-storeys is an optimum height from a viability perspective at present, for the delivery of apartment schemes at sales prices” within an affordable range specified. According to Census 2016, Ireland had 1.698m occupied housing units: 1.148m owner-occupied units, 497,000 rentals and 53,000 not stated. 612,000 households of owner-occupiers were without a mortgage, compared with 536,000 households with mortgage loans — 406,000 of the loan-free households were in the 60+ years age range. The CSO said rented accommodation has continued its upward trend with 497,000 households renting, a rise of 5% on 2011. This meant that renting was the tenure status for almost 30% of all of occupied dwellings. Renting from a local authority showed the largest increase, up 11% to 143,000 in 2016. The number of households which were rented either from a private landlord or voluntary body rose by 2% to 327,000 in 2016; 27,000 units were rented free. The overall home ownership rate dropped from 70% in 2011 to 68% (there is a slight discrepancy here with Eurostat data for 2016 below) — the rate was the lowest since 1971. According to Eurostat, in 2016 Ireland had a home ownership rate of 70% compared with Spain at 78% (2017); 62% in Denmark; 65% in France; 72% in Italy; 52% in Germany; 63% in the UK and an EU average of 69% (Eastern Europe has high rates of ownership e.g. Poland 83% and Romania 96%). In 2016 houses accounted for 92% of housing stock in Ireland; 34% in Spain (2017); 68% in Denmark (2017); 68% in France; 47% in Italy; 42% in Germany; 85% in the UK and an EU28 average of 57%. Among significant countries, the Netherlands has the highest population density in Europe at 498 people per square kilometre. Ireland is at 69; Spain at 92 and Denmark is at 136 — Sweden, Norway, and Finland at 24, 17 and 18 are anomalies because of the large inhabitable areas. The highest share of agricultural land use in the EU is in Denmark (63%), while Ireland, Hungary, and Romania each have shares close to three fifths. In Finland and Sweden agriculture has played a minor role in terms of land use, accounting for less than 10.0 % of the total land area in both of these member states. 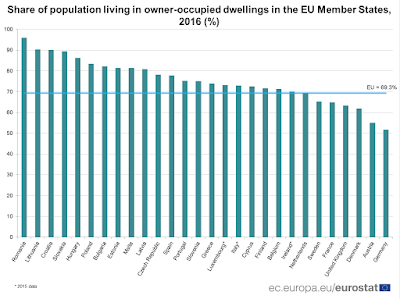 What is striking about average dwelling floor space is that despite Ireland’s low population density and the large ratio of houses, we are among the lowest in the EU. Ireland has an average floor space of 81 square metres compared with 115 in Denmark, 124 in Belgium and 107 in the Netherlands. The EU 28 average was 95. There is no scarcity of land in Ireland but smaller housing units are the existing default and the Government is trying to encourage affordable apartments (flats) by setting guidelines to make them even smaller and in Dublin City Centre, without car spaces. According to the Central Statistics Office (CSO), Ireland and Spain had the highest levels of dwelling completions per 1,000 population in the European Union over the period 2006-2015, despite both countries showing large falls since 2006. In 2006-2015, there were 72.1 house completions per 1,000 population in Ireland. However, despite the housebuilding surge, according to the CSO, the stock of dwelling per 1,000 inhabitants was 421 (425 in the graphic on top) in 2016 which compared with 417 in 2006 when there was a record 93,000 houses built. Greece, Portugal, France, Spain, and Germany have the highest number of dwellings per 1,000 inhabitants. The UK was just ahead of Ireland. The stock of Irish dwellings was at 2.03m in 2016 and the overall vacancy rate, including holiday homes, was 12.3%. If holiday homes are excluded from the housing stock the vacancy rate drops to 9.4%. In addition, there were almost 51,000 homes temporarily vacant on Census Night. The rate is high compared with Switzerland in 2015 at 1%, followed by the Netherlands, Germany, and Denmark. In Ireland, 37% of owner occupiers had no mortgage or loan on their property in 2016. This compares with 48% in Spain; 14% in Denmark; 10% in Sweden; 34% in France; 56% in Italy; 25% in Germany and 28% in the UK. The average of the EU28 was 43%. It’s commonly known that the Spanish were as crazy as the Irish with investment in housing in the decade before the Great Recession and its housing starts in 2016 were at 65,000 compared with 760,000 in 2006. Completions were at 54,000 in 2017 compared with 658,000 in 2006. Ireland’s CSO using a new methodology, reported this year that a total of 14,446 new dwellings were completed in 2017, a year-on-year increase of 45.7%. The ESB domestic electricity connections dataset, the basis of the old series, are used as a primary source for the new series. Completions were at 78,000 in 2007. Both the Netherlands and Denmark had big rises in private debt before 2008 and they like Ireland have been struggling to ramp up housing output in recent years. The Netherlands had 48,000 completions in 2015 and 43,000 housing starts. The data for 2007 is not available from the Dutch Central Bank. Rabobank reports 80,000 completions in 2007. Austria with a population of 8.7m — about half that of the Netherlands — had 67,000 housing starts in 2016! Denmark had 24,000 completions in 2017 compared with 32,000 in 2007. Housing starts were at 26,000 in 2007 and 21,000 in 2016. France had 345,000 completions in 2016 compared with 449,000 in 2007. France’s housing starts were at 419,000 in 2017 compared with 489,000 in 2007. Germany had 284,000 completions in 2017 compared with 603,000 in 1995. Housebuilding reached a peak in the UK in the late 1960s (the highest number of completions was 413,000 in 1968). Housebuilding has seen an overall decline since then, with the most recent drop taking place after the 2008 financial crisis. The 2012/13 financial year had the smallest number of completions since 1947 — the UK population was 55m in 1968. In the UK in the 2017-18 fiscal year, there were 188,00 completions. Germany has 42m dwellings; France has 35m and the UK has 28m. Their respective populations are 83m, 67m and 66m. The Netherlands leads with social housing accounting for about one-third of the housing stock. The Netherlands is followed by Scotland, Austria, Denmark, and Sweden. Ireland has a single digit rate as shown on the chart above. In Europe typically housing associations operate social housing and local management committees maintain strict rules. In Ireland poor local authority management and persistent anti-social behaviour have been a blight on residents’ quality of life, resulting in the decline in the standard of social housing areas. The city of Paris is divided into twenty arrondissements municipaux — administrative districts. The area is 105 km2 (kilometres) and with a population of 2.2m, it has a density of about 21,000 people per km2 — one of the highest in Europe. France's capital city is the core of the Paris Region called Île-de-France with an area of 12,011 km2 where about 12m people live. Its population density in 2018 was 1,019 per km2. The area of the city of Dublin is 115 km² and the 2018 population is about 565,000. The density is 4,910 inhabitants per km². The area of County Dublin is 921 km² and its population in 2016 was 1,345,402, giving a density of 1,461 per km². The Dublin city boundary was extended to some of the new sprawling suburbs of the 20th century and today coincides with the area that is the responsibility of Dublin City Council. Eurostat says that on a 1 km² population grid covering the whole of the EU-28, the highest level of population density has been recorded in the south-western suburbs of Barcelona, within L’Hospitalet de Llobregat (where 53,119 persons lived in a single square kilometre in 2011). The second highest ratio (52,218 inhabitants/km²) was recorded within the 18th arrondissement in Paris, not far from the Basilica of Sacré Cœur. Selling off social housing to tenants in Ireland, and subsidising private rentals seemed a convenient solution in the 1990s and into the new century. For local authorities, it reduced the hassle with high rent arrears and repair demands. However, the development resulted in the role of local authorities in managing building land supply being diminished while giving greater control to private investors. For example, local government in the Netherlands has been involved in developing land for building for decades, and selling it at a profit to fund social housing. The fact that it has a clear system for compulsory purchase aids in acquiring land at a reasonable price. Metropolitan Vienna is home to 30% or 2.6m of Austria's population (County Dublin has 28% of Ireland's population). Half a million people live in city-owned housing and 76% of the population are tenants. In the city of Vienna, as distinct from the metropolitan region, single-family homes account for only 4% of housing. The city has a population of 1.8m. Private developers who work with the city government to build affordable housing must allow the city to rent half of the new apartments to lower-income residents. Rents are regulated by the city government so that none of the residents pay any more than 20 to 25% of their household income for housing. Vienna is a UNESCO World Heritage City and UNESCO is in talks with the city government on developments in the historic city centre (UNESCO doesn't use the term "historical" as its selections are just not old! ), including high rise. In 2018 in a global ranking of cities, Vienna ranks highest for quality of living for the 9th year in a row. Social housing in Vienna: the Vienna Model — "Social housing in Vienna is aimed at the middle class to provide the best possible social mix. This approach has enabled Vienna to avoid socially fragile" neighbourhoods." In Part 1, I have described the Irish development land system and in Part 2, I have given space to the issue of high rise. Top 15 cities in world for high rise buildings. Two high profile politicians in Dublin, one a government minister, in 2016 objected to housing developments in their constituencies as the property values of neighbouring homes would be impacted. Leo Varadkar is now taoiseach/ prime minister and Clare Daly is a prominent independent member of the Dáil. During the property bubble, developer Seán Dunne objected to planning permission for a 3-storey block of seven apartments and underground car park, on Shrewsbury Road, Ballsbridge, South Dublin, where he then lived. The development required the demolition of the former Chester Beatty Library. Just a short distance away, other Nimbies were objecting to Dunne's plans to build a 37-storey tower on the sites of two hotels. As for high rise, I live on the 24th floor of a 40-storey tower in Kuala Lumpur, which has 9 lifts/elevators with opposing doors. It has several amenities on site and many more a walk away. I wouldn't trade the place for a poke in Dublin! According to Census 2016, 61.4% of working Irish commuters drove to work in 2016 while just 10% took public transport. Walkers accounted for less than 1 in 10 of the commuting population. High house prices in Dublin are a significant push factor driving the population towards the rural fringes of the city where it is cheaper to buy or build a house. Another push factor is the small size of apartments in the city centre, forcing families with children needing more space to move out of the city where houses prices are lower and housing more affordable. Personal housing preferences also play an important role as rural living is the Irish housing ideal. This preference is realised in single-family houses in open countryside with the benefits of the proximity to the capital or other urban areas. The realisation of this ideal is greatly facilitated by the planning regime which imposes few constraints on the conversion of agricultural areas to low-density housing areas."